Donald Pine is the major character in Scott Sigler’s novel The Rookie. As first string of the three quarterbacks playing for the Ionath Krakens, he is an important character in the story development and acts as a mentor and moral foil for the series main character Quentin Barnes. As with many characters in The Rookie, not much is known about the early years of Donald Pine. He is a normal-G human Most likely a citizen from the Planetary Union. 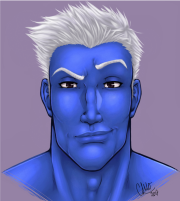 Described as a "... a blue-skinned native of Satirli 6..." it is this blue skin which is a point of derision from Quentin and other Purist Nation players as it is a indication of "interaction with the sub-races." He is most likely a citizen of the League of Planets. At some point Donald Pine ascends the ranks of the GFL to play Quarterback with the Jupiter Jacks in Tier 1. While with the Jacks, Pine leads the team two consecutive Tier 1 GFL Championships in 2675 and 2676. After the 2676 Championships Pine was Traded from the Jacks to the Bord Brigands after 3 straight losing seasons in 2680. It was later found that in 2677 Pine lost a great deal of money betting on a Jacks game against the To Pirates in the semi-finals of the Tier 1 Championships. It was Mopook the Sneaky, a lieutenant in Gredok's organization, to whom Pine owed. Owing money and with no additional assets to pay his debts, Pine began to throw games. This was the start of what would become Pine's reputation of "not being able to win the big games." After only a year with the Brigands Pine was traded to the Ionath Krakens in 2681 to become the most expensive player in that franchise's history. The hope was that Pine would would lead the Krakens from Tier 2 up to Tier 1. In the year 2682 (The year in which The Rookie takes place) Pine is the lead quarterback for the team. In the 2682 season Pine was rocked with several injuries which placed rookie Quarterback Quentin Barnes into the starting position. In the Krakens second game against the Grontak Hydras Pine sustained a severe injury to his knee which kept him from playing for the next two games. Pine was also assaulted and sustained injuries which kept him out of the Krakens' 7th game against the big diggers. This second set of injuries brought to light Pine's gambling debts and all but secured Barnes's position as starting Quarterback. In a surprise move, mostly Due to the Death of Mitchell Fayad in Quyth Irradiated conference Title game, Pine was brought back in as Quarterback for the Krakens in the semi finals of the Tier 2 Championship. Despite a great challenge, Pine and Quentin were able to lead Krakens to victory over the Texas Earthlings assuring the Krakens a tier one Slot in the upcoming Tier 1 Season. Pine is a master of the short game. Said to be able to dissect any defense if given enough time, Pine is perhaps one of the best Quarterbacks to have played the game. Time will tell what his legacy will be to the GFL; Be it his two GFL championships, His consummate skill, or the controversies surrounding his gambling problems. Due to the peculiarities of Sklorno Culture, Quarterbacks are treated as being worthy of great respect and reverence. Donald Pine, a two-time galaxy Bowl winner is said to have at least thirty-two confirmed houses of worship dedicated to him throughout Sklorno space. Pine at times uses this worship to fully motivate his Sklorno Receivers. In the print version of the novel there is made reference to "...Blue Skinned women of Satirli 6..." Whereas the podcast clearly states "Baker 6." This is the only clue which is given as to what planet Pine might be from. As in all cases, the print novel is considered canon. This page was last modified on 19 May 2017, at 14:29.